ENJOY YOUR HOME THEATER ENTERTAINMENT WITH ELEPHAS NEWEST SMART VIDEO PROJECTOR, CHRISTMAS GIFT FOR YOUR FAMILY & FRIENDS ! 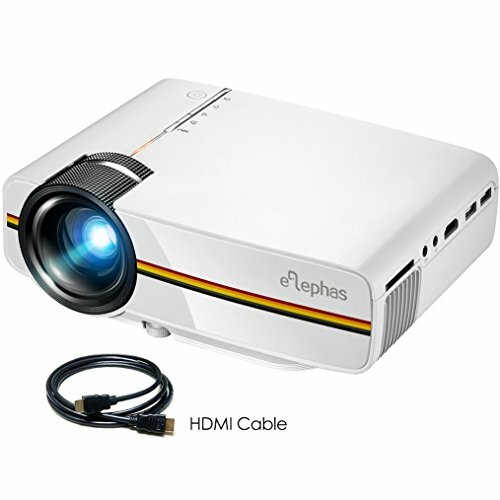 Elephas YG400 Video Projector provide 50~130 inches large projection size for you with better visual experience just like you are in a cinema. Built-in mercury-free led lamp cares for your eyesight. Built-in kinds of ports provides you more choice when using, connecting to PSP, TV Box, DVD player just as you like. A considerate holiday gifts for your family and friends, especially ideal for family gathering. 1. NOT Recommend for PPT, Word, Excel or business presentation. Recommend to use in dark places. EXCELLENT PICTURE QUALITY ---- You can adjust the picture size from 50 ~ 130 inch ( Best for 100 inch ). Projection Distance is from 4.95 ~ 13.12 ft ( Best for 7.2 ft ). 800 x 480P Native Resolution, the contrast of 1000 : 1. STRONG CONNECTION ---- ELEPHAS YG400 Home Theater Projector enable to connect to Amazon Fire TV Stick/ Roku Streaming Stick/ Chromecast/ Laptop/ DVD/ PS3/ Xbox/ TV box via HDMI input; Connect to PC via VGA jack; Hook up to headphone/ outer speakers via Audio port; Insert U-disk/ hard disk device into USB slot. Adapters are required if you connect the projector to a iPad, iPhone or other tablets and smartphones. COMPACT & PORTABLE ---- Small Size and Light Weight of ELEPHAS YG400 Home Theater Projector enables you to take it to anywhere you want. Easy to set up, a Smart TV can be completely replaced. Ideal for Christmas and Thanksgiving Party, Home Theater Entertainment, Family Movie Time, Football / Sports Events, TV Series and Video Games. ENVIRONMENTALLY FRIENDLY ---- ELEPHAS YG400 Home Theater Projector is a environmental friendly device. Low Power Consumption, Durable and Energy Saving - Adopted latest smart eco Lamp care technology, the LED bulb inside can save energy up to 70%, long lasting Lamp life (≥30000 Hours). FULL ELEPHAS WARRANTY ---- Full ELEPHAS 3 years Warranty, 3-month Hassle-free Return / Replace. Premium Customer Services and Lifetime Professional Technical Supports for ELEPHAS YG400 Home Theater Projector. Comes with free HDMI cable. If you have any questions about this product by ELEPHAS, contact us by completing and submitting the form below. If you are looking for a specif part number, please include it with your message.